Ancient artifacts smuggled into the U.S. and purchased by Hobby Lobby are shown at a May 2 event returning the artifacts to Iraq in Washington, D.C. 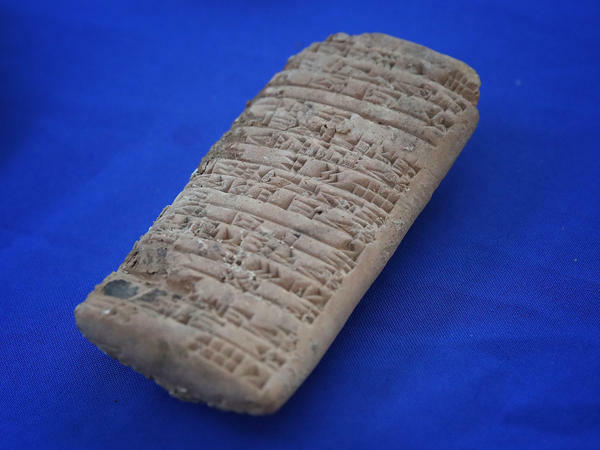 The seized artifacts include cuneiform tablets from the little-known ancient city of Irisagrig. 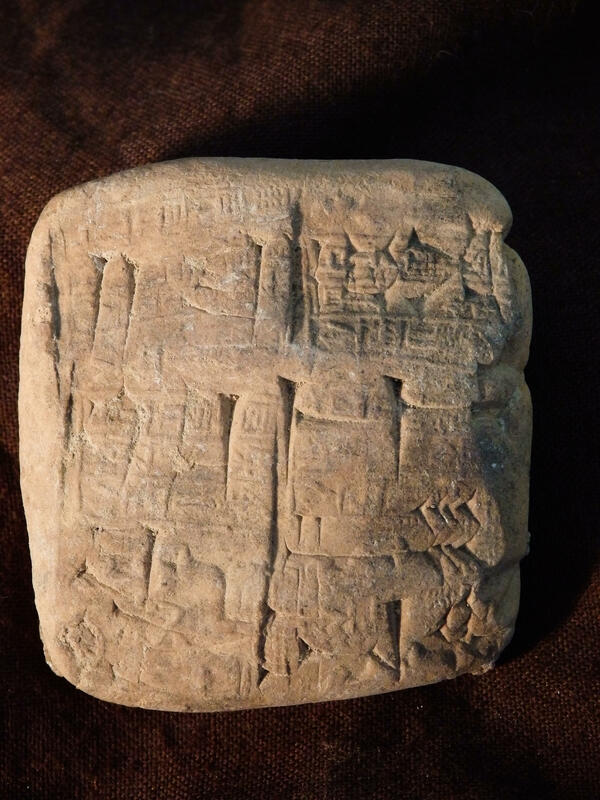 A clay tablet from the seized Hobby Lobby collection bears a cuneiform inscription referring to the disbursement of leather bags to hold water, known as water skins. The inscription is dated with the name of a month used exclusively in Irasagrig, a lost ancient city in present-day Iraq. Ancient artifacts seized from Hobby Lobby are shown at a May 2 event returning the artifacts to Iraq in Washington, D.C. The seized artifacts include cuneiform tablets from the little-known ancient city of Irisagrig. 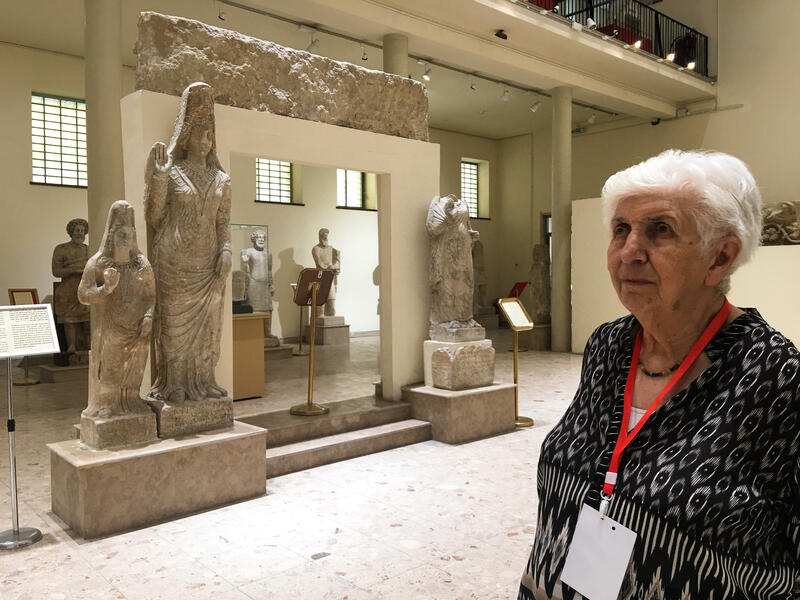 Archaeologist Lamia al-Gailani at the Iraq Museum in Baghdad. The museum was looted in 2003 after the U.S. invasion of Iraq. Some of its antiquities were recovered but looting has continued in the south of Iraq, where thousands of ancient sites yet to be excavated by archaeologists are unprotected. "They were not in great shape. They had infestations of salt in them, so it's not that I could say I had been able to read everything," says the Yale University professor. "My main goal was to provide a general assessment from when and where did these tablets actually originate." Frahm determined the tablets at the center of a federal case against the Oklahoma-based Hobby Lobby arts and crafts chain were from a place few had ever heard of — an ancient Sumerian city called Irisagrig. "You could argue that this is a lost city because this place has never been properly excavated and you don't even know exactly where it is," Frahm tells NPR. But looters know. The roughly 250 tablets Frahm examined in 2016 were among 5,500 objects, including ancient cylinder seals and clay seal impressions known as bullae, smuggled into the U.S. starting in 2010. Shipped from the United Arab Emirates and Israel without declaring their true Iraqi origin, some of them were marked "ceramic tiles" or "clay tiles (sample)." They'd been purchased by Hobby Lobby for $1.6 million. In a settlement last year with the Justice Department, Hobby Lobby agreed to forfeit the objects and paid a $3 million fine. In May, about 3,800 objects were handed back to the Iraqi government at a ceremony at its Washington, D.C., embassy, and will be returned to Iraq later this year. Last November, Hobby Lobby president Steve Green, the son of the craft store chain's founder David Green, opened a Museum of the Bible in Washington, D.C., which contains another $201 million worth of ancient artifacts tied to Hobby Lobby. The museum said in a statement last July that "None of the artifacts identified in the settlement are part of the Museum's collection, nor have they ever been." The world's first civilizations sprung up between the Tigris and Euphrates rivers in what is now Iraq. Objects from archaeological sites in the south have been prone to wide-scale smuggling since the 1990s, particularly due to southern Iraq's porous border with Kuwait, according to archaeologists who specialize in Iraq. Looting intensified in the security vacuum after the 2003 invasion of Iraq. Apart from the loss of the artifacts themselves, crucial information placing them in the context of where they came from is also lost when undocumented objects are removed from their original sites. Frahm says a database established by Spanish archaeologist Manuel Molina and others guided him in determining the origin of the Hobby Lobby antiquities. It was based on inscriptions of other looted tablets that surfaced after the 2003 invasion of Iraq. Those tablets marked the first time archaeologists were known to have seen the name Irisagrig. According to one of the cuneiform tablets, it took four days to tow boats upstream from Umma, a better-known ancient Sumerian city, giving Molina a rough probable location of the lost city in the south of the country. Umma itself is one of the most heavily looted of all known ancient sites in Iraq. Thieves dug hundreds of holes into the tells — the mounds under which the ancient city is buried — after security collapsed following the 2003 U.S. invasion. The remains of thousands of other ancient towns and cities likely exist under other mounds, archaeologists believe. "Don't forget, even if we take only ancient Iraq, it's 3,000 years — so they didn't live in just one or two cities," says Lamia al-Gailani, a British-Iraqi archaeologist with the Iraq Museum in Baghdad and the University of London's School of Oriental and African Studies. She has worked on Iraqi antiquities since the 1960s. "Southern Iraq is absolutely full of these mounds," she says. Archaeologists believe about 5,000 tells exist in Iraq, Frahm says. Only a few have been properly excavated. Irisagrig is not one of them. "The city of Irisagrig is only known from other tablets," he says. "Many were sold on eBay, some made it into various private collections. And it is from these other tablets that we know the tablets from the Hobby Lobby collections — some of them, at least, if not all of them — are from that very city." Frahm says he was able to verify the tablets' origin by references and seals, including that of an official known to have been governor of Irisagrig some 4,000 years ago. The tablets constitute a local government archive that includes records of commercial transactions, official visits — even notations on what the palace dogs were fed. "It seems life in Irisagrig was actually pretty good," says Frahm. "The dogs didn't get meat. They got cereal ... but other low-level inhabitants of the palace, including some female weavers, got rations composed of meat — and that is something unusual at the time." The Irisagrig tablets were administrative rather than religious, Frahm says, but would have been inscribed around the same time that those following a literal interpretation of the Old Testament believe the patriarch Abraham lived. Some believe the city of Ur referred to in the Bible as Abraham's birthplace is the ancient Mesopotamian city of the same name, in what is now Iraq. 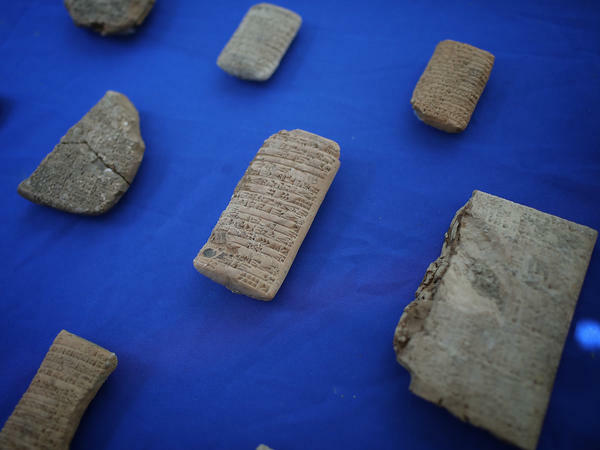 Frahm says apart from the Irisagrig archive, the Hobby Lobby artifacts that are being returned to Iraq also include tablets dating from about 2500 BCE (an alternative to "B.C." commonly used by scholars to denote "before the common era") with incantations to the gods, Babylonian letters from between 1900 and 1700 BCE and hymns from several hundred years BCE. Frahm describes the incantations as some of the most important pieces in the collection. The tablets, about 300 years older than the Irisagrig tablets, invoke three Mesopotamian gods. He says another text from the first millennium BCE is written in both Babylonian and Emesal, a dialect of Sumerian he says was originally a language used only by women. Most of the other items were clay bullae, used as seals for documents, and cylinder seals — small, intricately carved stone cylinders whose impressions in clay served as signatures. "I don't think there were any that were particularly unusual, but some of them were nice seals," says Elizabeth Stone, a Stony Brook University archaeologist who was asked by U.S. authorities to examine the seals to ensure they belonged back in Iraq. "Some of them were good, hard stones with very clear impressions, and some of them weren't," she says. "They were a very mixed bag. They might well have been purchased not in Iraq, but from Israel and the Gulf, from where they were sent." Stone says she believes the hefty fine Hobby Lobby has paid could deter some imports of looted antiquities into the United States. But looting is sure to remain a problem, experts say, as most of Iraq's archaeological sites are unprotected and other large markets remain outside the U.S. Archaeologists believe many private collectors of looted Mesopotamian antiquities are wealthy Gulf Arabs. "After the 1991 [First Gulf] war, the Iraqi government lost a lot of control in the countryside, particularly in the south," says Gailani. "The north has antiquities, but it's a different type of antiquities and looting it is more difficult. The south is easier and attractive, because it's small objects, tablets ... Everyone wants tablets." "It's easy to get," she says. "You dig a hole and most probably you will find something."